What do you do if you’re injured on the job? The first thing you should do is file for worker’s compensation. Worker’s comp can cover the costs of your medical treatment and missed work without ever going to court. Unfortunately, many workers let their chance for worker’s comp pass by. This can leave you with unpaid medical bills and little to no income while you’re unable to work. We want every injured worker to get the financial compensation they need. Almost without exception, it is always in the best interest of an injured worker to file for worker’s comp. Worker’s compensation is not a lawsuit. You don’t have to sue anyone to get your payout. It’s an insurance claim filed with the policy carried by your employer. Your boss does not pay it out of pocket; their insurance pays it. Every injured worker is eligible for worker’s comp. Filing for worker’s comp is a routine practice following any workplace injury. An office worker can file for compensation if they trip on the steps at work. Every injured worker is eligible for injuries that occur on the job. You CANNOT lose your job for filing for worker’s comp. 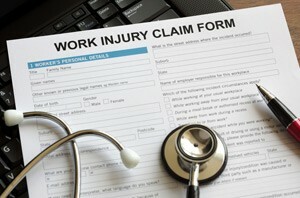 Employers don’t fight worker’s compensation claims. The insurance company may argue the details of your case but your employer takes no part in it. In fact, employers are happy to have worker’s comp because it protects them from being sued. You don’t have to prove negligence. Sometimes a workplace injury is caused by a safety violation, and sometimes it isn’t. You are covered regardless of the cause. You don’t have to prove anything about the safety conditions at work. You do not give up your rights to a lawsuit. In some cases there really is grounds for a lawsuit. In that case we usually recommend filing for worker’s compensation anyway. You’re allowed to do both, and worker’s comp will pay out whether you win your court case or not. When you’ve been injured at work the first thing we’ll normally do is file a worker’s comp claim for you. To do this, we give formal notice to your employer’s insurance company. We then pull together all of the records related to your case. This can include the accident report, witness testimony, and the medical records from every doctor you’ve seen related to the injury. We’re thorough because we want to make sure you’re fully compensated. Insurance companies will try to get out of paying for treatments wherever possible. Once the claim is approved, your medical expenses and your lost earnings will also be paid. There will be medical evaluations from time to time as well. These evaluations determine how you’re recovering and if you need further treatment. In theory, you have two years to file a worker’s comp claim for an injury. The two year countdown begins from the date of the injury; however, you don’t want to wait longer than you have to. This is because insurance companies may try to “disclaim” your case, denying you compensation. Disclaiming is something insurers do when they believe a case is frivolous. For example, if you wait a year and a half to file your claim, they’re going to ask why you didn’t file it sooner even though you were within the deadline. Their argument will be that if you weren’t in pain the week after the injury, there’s no reason you would be 18 months later. They’ll try to leave you out in the cold. We know that not all injuries are obvious right away. Some start off seemingly minor and get worse over time. At The Weinstein Law Group, PLLC we’ll fight for you no matter when the injury happened. But your case will be strongest and face the least opposition if you come to us as soon as possible. For 30 years Steven Weinstein has been helping workers of all kinds get their worker’s comp benefits. Navigating this process isn’t easy. There’s paperwork, bureaucracy, deadlines, and the insurance company will be working against you every step of the way. Steven will help you get everything filed correctly and get the full amount you’re entitled to. Most importantly, he will listen to you and help you make the best choice as to how to pursue your case: whether that’s worker’s comp, legal action or both. No one deserves to live in financial jeopardy because of an accident at work. Call The Weinstein Law Group, PLLC Group today and get started down the road to financial compensation. The Weinstein Law Group, PLLC does not charge anything unless you get money. We also offer a free consultation to help you decide whether you want to go forward with your case. Call us at 212.741.3800 or contact us online and get your free consultation today.